When Ed and I were first dating, Ed talked about his love for skiing. He went on a big ski trip every winter, and one of our first dates was with his ski buddies. We met them for dinner so that they could look at pictures from their recent trip to ski in Utah. Ed was so eager to have me learn his favorite sport that he took me skiing as soon as he could. Which is not easy here in the Midwest. Due to a fear of heights, I ended up blubbering in the middle of the ski hill, terrified to keep going down. Ed patiently talked me down that ski hill. Unlike me, Ed seems fearless. Remember the time we both rode the zip line? Ed showed abandon as he careened over Beaver Meadow! 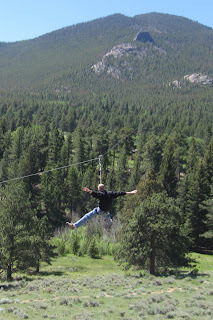 I, on the other hand, waited until the very last minute to zoom the zip line. I was trembling in my boots and could barely get up the courage to climb up the pole. But with Ed’s encouragement, I was able to do it. On a camping trip, after climbing to the top of a bluff in Wisconsin, I walked closer to the edge to see the view. Ed suddenly yelled at me, “STOP!” Imagine my surprise! He’s back by a tree, and while I was nowhere close enough to the edge to actually fall off, I could clearly see Ed was very nervous. I asked him what was wrong, and the truth came out. Ed is afraid of heights. “What about skiing?” I asked him. “That’s different!” Ed replied, but I really didn’t quite understand. I was surprised to hear these words come out of my frugal husband’s mouth. “What’s stopping you from doing it?” I say. “I’m afraid,” is the answer. Oh. That pesky fear of heights. “Let’s go,” I say, and I follow Ed outside to hold the ladder for him. That’s all he needed. Even though we both knew I really wasn’t doing much good by holding the ladder, just having me out there made Ed feel better. It’s nice to be able to hold Ed’s ladder for him. Sometimes it seems like Ed is the one who is always supporting me; I’m the one with the crisis, I’m the one who’s falling apart, I’m the one who’s needy. Holding Ed’s ladder reminded me that we’re partners in this marriage. He needs me, too. I hold his ladder; he holds mine. Whose ladder do you hold? I love hearing about your adventures! You two are so romantic! So true! Wonderful post and a good reminder of how I need to be there for my DH like he is for me. I loved this. And I do think it makes a difference to know that someone is holding the ladder. We have the same problem with our gutters … but even with holding the ladder, we're both too scared to go up there. And I bet you find it so touching to find a bit of fear in this seemingly fearless guy! What a sweet and thought provoking post! Thanks for the warm welcome today! That is so sweet you holding the ladder for him. It is surprising that he would be afraid of heights when he has done other things up high in the sky. I remember those days of cleaning out the gutters in the midwest! You put it so beautifully! It is a wonderful thing that you 2 have each other to hold the ladders! I to am blessed with my husband, many times over the last 15 years we have traded off the ladder holding! So thoughtfully put! So many relationships in our lives would benefit if we were consciously "holding the ladder." Ginny…this great!!! What an awesome lesson…it brought tears to my eyes. I think my husband is in a season of needing me to hold the ladder and I wasn't realizing it…God spoke through you!!!Thanks!! !Oh, the last time my husband was on a ladder he feel…down on our hedge trimmers…at the age of 54!!! I don't think he will ever get back on a ladder.